أسئلة وأجوبة: (Symptom) Not working on "RealTek High Definition Audio"? It seems "Stereo Mixer Devices", which are often required to record any PC sounds, have often been hidden/disabled on this sound chips by default. Some people successfully fixed this issue using the latest drivers. - It may not work for all the PCs though. Some people say you should install the driver twice to make it work on Windows 7/8. Install it first, and then re-install it after rebooting the PC. (Symptom) Only "Only Voice" option is available on Windows XP. / Some functions are not working. We first recommend you to update your sound card driver (audio driver). In most cases, it can fix the problem. Still not working? Then, it may be because your sound card is "Realtek HD Audio". If so, please read the next FAQ section. Otherwise, we may be able to fix it easily. Please generate an error report file through "About -> Generate Error Report File.." and send it to us. We'll see what we can do to fix the problem. This is tougher one to support. We are working on it. "Stereo Mix", "Stereo Out", "Wave Out Mix", "Wave Out", "What U Hear", "WAVE 出力ミックス", "ステレオ ミキサー", "再生リダイレクト", "モノラル ミキサー", "Mono Mix"
However, on "Realtek HD Audio", these controls are disabled initially, and they can't be enabled easily by other programs. This is why our program usually shows only "Only Voice" option on this card. Many people are suffering from this, and you may find some solutions from Google Search Results for "Realtek HD Audio Stereo Mix". Follow-Ups) Some people successfully fixed this issue using the latest drivers. - It may not work for all the PCs though. (Symptom) Volume Adjustment? Some noise mixed? You can adjust the recording volume from "Boost" menu. Also, if you hear some noise, you may try to set it to minus (%) level. This happens because some sound drivers keep failing in reporting correct playback frequencies. You may be able to fix it by updating or reinstalling your sound driver. 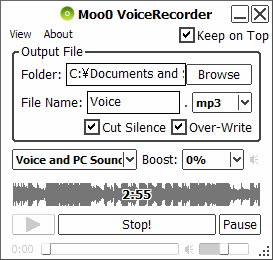 Or, you can also manually fix the recording speed through "Setting" -> "Recording Speed Adjustment" menu. This happens because many sound drivers are still not fully supporting Windows 8.1. You may have to update your sound driver, or even have to wait for the release of the new sound driver by your vendor.